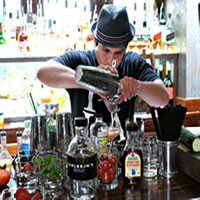 Seeking a career as a Craft Cocktail Bartender? Do you enjoy fresh fruits, flowers, other exotic ingredients? Are you detail oriented and picky about the perfectness of every aspect of your drink? Craft cocktails might just be your calling, especially if you enjoy crafting cocktails for each guest! Ever wonder how or why restaurants come up with specific fruits and garnishes for those fancy drinks at that new hipster bar down the street? It comes down to understanding and studying not only recipes, but what garnish will compliment and complete the beverage. Nowadays customers are expecting so much more. The crafty bartender doesn’t just serve a rum and coke with lime anymore, going the extra mile creatively is necessary. The Craft Cocktail Bartender is in demand more now than ever before. Restaurants both big and small target mixology experts to join their staff. At Fine Art Bartending, we can train you up in the essentials to set you on your way to cocktailing. Bar Chef, or bartending chef, is a term that has really come into its own. The ‘chef’ is a cocktail bartender who takes those classic drinks and boosts them to the next level by using fresh fruits or flowers etc. A big part of craft cocktailing is understanding what fruit is in season. How the citrus, or sweetness compliments the overall taste of the drink. A perfectionist will even consider final cocktail colour in addition to presentation and aroma. Many bartenders are now working with experienced chefs at high end lounges and hotels, to craft the perfect drink. If you have OCD and love attention to detail, you will be perfectly suited as a Craft Cocktail Bartender. Time and effort are key is this line of work, something you might not experience somewhere super busy. Craft Cocktail enthusiasts appreciate the drink and the fresh ingredients, the methods and the finishing touches. This business, regardless if you’re in a restaurant, nightclub or hotel, the end game should be the same: IMPRESS the guest. When you work in a hotel or high end cocktail lounge, you have way more time to interact with your guests. Meaning you can really get a feel for who they are and what they like, which is very important when selecting cocktails for them. You may get lucky and have that adventurous person who will be your ginny pig so to speak, try anything you throw at them. This is a great way to find out if you have the magic touch and they are putting their trust in your capable hands. Don’t be intimidated by people in a hotel or martini lounge, they are there to be wowed and to enjoy themselves, work with them and make sure they return! Having knowledge of your spirits and liqueurs is huge in craft cocktailing, what goes with what and what is in season for people to drink. Usually guests like lighter spirits in the Spring/Summer and heavier, more spicy spirits in the Fall/Winter to warm them up. Have some fun with holidays and seasons, lots of different colours and tastes. Remember everyones palate is different. Don’t go off the deep end with spices and bitters, but don’t be afraid to play and experiment. Guests will appreciate someone who knows their stuff but isn’t afraid to experiment. Study the classic cocktails of the world. Essential classic drinks include the Old Fashioned, Negroni, Classic Martini, Cosmopolitan, Whiskey Sour, Sazeracs to name a few. Know classic cocktails and what makes them classic, then the possibilities are endless to throw your own spin on them. Study fruit and growing seasons and availability. Learn how to cut each of them and store for best presentation. Investigate the world of bitters and edible flowers. If all these components get you excited, it will show in your work. The end result will be extremely satisfying for you and the person sitting at your bar! We at Fine Art Bartending can put you through the paces and teach the essentials in mixing up a drink. Experience comes with time and passion. After two weeks of introducing you to proper bartending practices, you will be ready to pursue your new hobby. What you decide to make for cocktails is completely up to you.